St. Francis High School in Mountain View parlayed a $15,000 investment in the company that developed the Snapchat app into a windfall of at least $24 million. MOUNTAIN VIEW: Bake sales and car washes? Not for one Silicon Valley parochial high school that hit it big this week and, by doing so, highlighted anew gaping economic disparities in the region. St. Francis High School in Mountain View parlayed a $15,000 investment in the company that developed the Snapchat app into a windfall of at least $24 million, capitalizing on a unique venture capital fund set up by the school's investment-savvy parents. The fund paid off when Snap Inc. began selling shares to the public Thursday and the school sold about 1.4 million of the 2.1 million shares at $17 each. It's holding the remaining 700,000 shares, which were valued at about $19 million Friday. 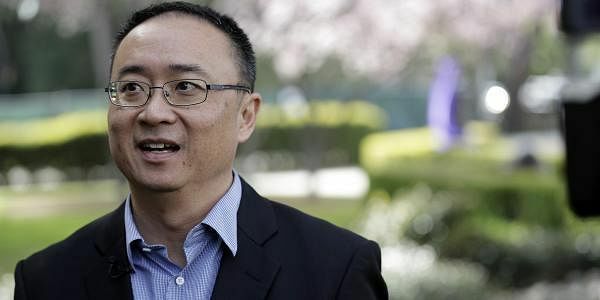 "Silicon Valley is a pretty amazing place to live," school President Simon Chiu said. "This obviously couldn't have happened anywhere else." St. Francis High School launched the fund in 1990 at the urging of two of the many venture capitalists with children attending the school. The fund's aim is to tag along with deep-pocketed investors when they make big bets on startup companies. The school takes a small sliver of a venture capitalist's bigger investment in a startup company. Chiu and other educators say they know of no other school with a similar fundraising scheme. About 10 miles north, in East Palo Alto, educators are focused on raising graduation levels in a predominantly Latino community with high pockets of poverty. The city of about 30,000 just a few miles from Stanford University has succeeded in lowering a staggeringly high homicide rate in the early 1990s to the national average and income levels have risen to about $48,000 for a family of four compared with $120,000 in next-door Palo Alto. The median income in Mountain View is $83,000. But East Palo Alto still struggles with a dropout rate hovering about 50 percent annually. "We don't have the bandwidth to follow the stock market," said Amika Guillaume, principal of the East Palo Alto Academy, which is in one of the poorest cities in Northern California. "It's tough enough keep kids on track to graduate." Chiu declined to disclose the size of the school's venture fund, but he said it currently holds investments in about a dozen other companies. He said the money will be added to the school's endowment, which will double it, while administrators decide how to spend the infusion of cash. Generally, the windfall will enable the school to offer scholarships, retain faculty and improve facilities, Chiu said. "I think everyone understands it's a pretty transformational event for our school," he said. Before the Snap investment, the school's biggest profit from a single investment was $2 million. Chiu also said the school has lost money on several investments. The school's Snap saga began at the kitchen table of venture capitalist Barry Eggers. Eggers said he came home from work one day in 2012 and found his children and their St. Francis schoolmates sitting at the kitchen table, giggling over the new Snapchat app, which allows users to easily exchange messages with videos and photographs. Best of all, the images automatically destruct after a few minutes. Eggers researched the company and negotiated a $500,000 investment with the company founders, including a $15,000 contribution from the school. "It all started at my kitchen table with my kids," Eggers said. "Only in Silicon Valley."